Disclaimer: I have no relevant conflict of interest relationships to disclosure, and have no affiliation with the makers of iBGStar. 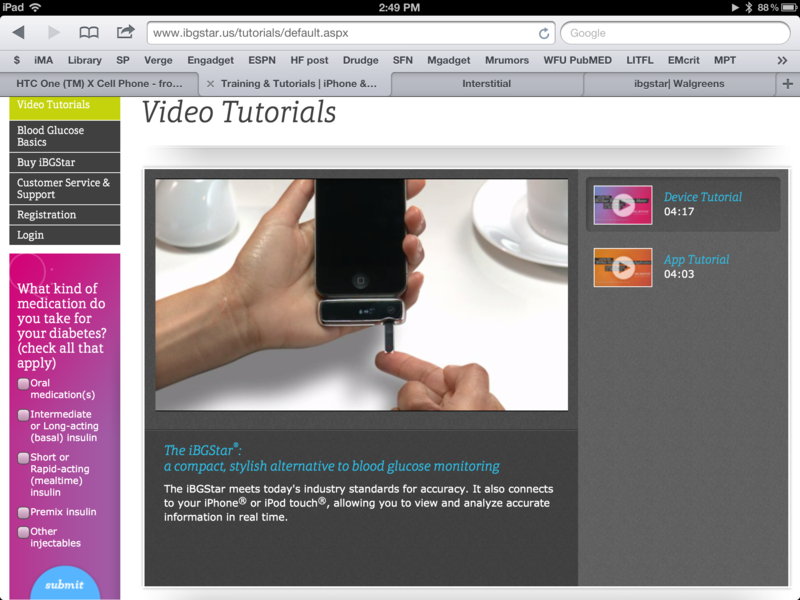 Recently making it’s debut into the online Apple Store is the much hyped and anticipated iBGStar Blood Glucose monitoring system by Sanofi US. Although the peripheral device had gained clearance by European regulators more than a year ago, only at the end of last year did the glucose monitor receive FDA 510(k) clearance. The peripheral device connects to your iPhone or iPod Touch and allows patients to record their glucose levels using the accompanying test strips. The accompanying app and sync capability is where this iPhone medical peripheral truly shines. The app allows patients and physicians to analyze glucose levels in a multitude of ways, and hopes to allow better glycemic control and titration of diabetes medications. 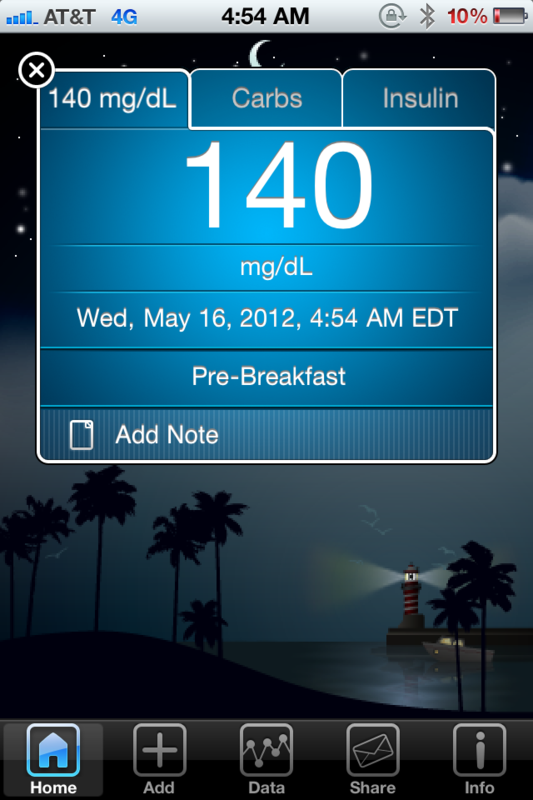 Although I’ve been skeptical of some iOS health peripheral devices in the past, I think iBGStar is a different beast. Even though the majority of diabetics might not be able to afford it or have access to it, it shows a great fusion between mobility, software, and hardware. I preface this by saying the iBGStar peripheral device and app combination are by no means a home run, and there are serious drawbacks physicians need to consider before recommending the device to their patients. 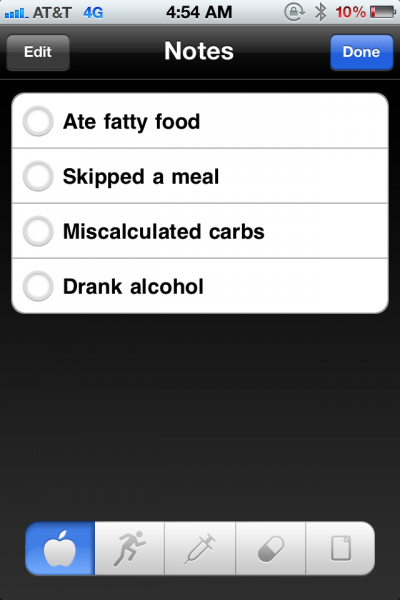 The app then tells patients their glucose levels and appropriately records them, allowing patients to add key information such as carbs, setting, and other key notes. I’ve used Withings’s body scale device, and the setup required for iBGstar is definitely easier. The ease of use of iBGstar is essential for patients who are not tech savvy. 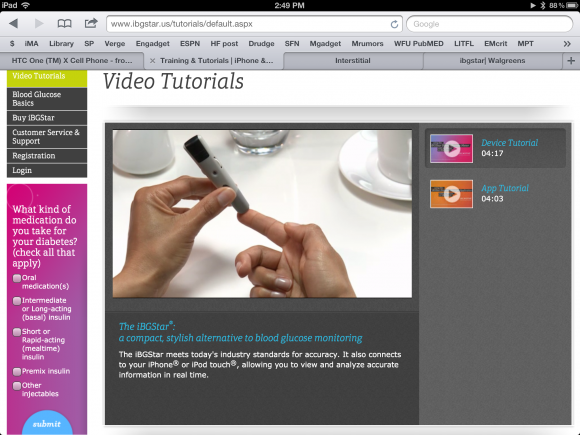 There are also great tutorial videos that break down how the device and app are to be used. The device is now widely available. It can be picked up at your local Apple Store or your local Walgreens, or bought at their online stores. The device is priced at $99.99 at the Apple Store, however, it’s cheaper at WallGreens, selling for $74.99; We’ll get into the issues with the total cost to own in a price breakdown later in this article. I’m always hesitant to recommend products to patients that are only available online, and having major retailers carry the device make suggesting it to patients much easier. You are at least assured your patient can go back to their local retailer if the device doesn’t work or if they aren’t fond of it. One of the largely unheralded features of the app is the integration with iPod Touch devices. As of last year, iPod Touch devices made up to one third of iOS sales, and for parents who have children with type 1 diabetes but don’t want their young ones to have an iPhone, an iPod Touch is a viable option. The iBGStar app can be used without owning the iBGStar peripheral and can be used by patients to meticulously track their blood sugar levels. 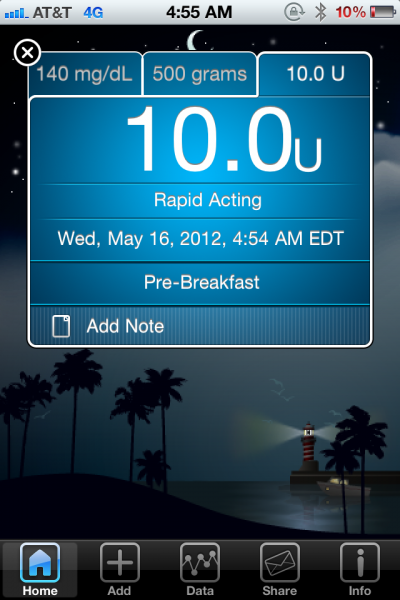 The app alone is a must download even for those who don’t even have the iBGStar peripheral. With the iBGStar peripheral in tow, you get a great marriage between a mHealth peripheral and mobile phone. Using this data, physicians can appropriately titrate up or down various diabetic regimes. Customers in the U.S. can buy the glucose meter from their local Apple Store or the online Apple Store for $99.99. Walgreens is actually selling the peripheral for $74.99. Those with diabetes and in healthcare know the price of the actual device often isn’t the limiting factor, rather the test strips are. Unfortunately, the strips will set you back, costing a little more than $1 each, more than twice the amount of typical test strips. So for a patient that uses three test strips a day, the test strips cost approximately $100/per month. Sanofi does offer a program to help patients pay this cost. For mobile, unfortunately, there is a premium. And this premium will clearly price the peripheral out of range for a significant patient population. The iBGStar peripheral has a small form factor, which is great, but it doesn’t take into account next iterations of the iPhone. There have been rumors Apple will do away with the standard dock connector, and if this happens it would make the iBGStar useless for patients who upgrade to the next generation iPhone. Will this device help your patients achieve better glycemic control? I don’t know. And those who claim it definitely will are doing so based on hype, not definitive evidence based data. 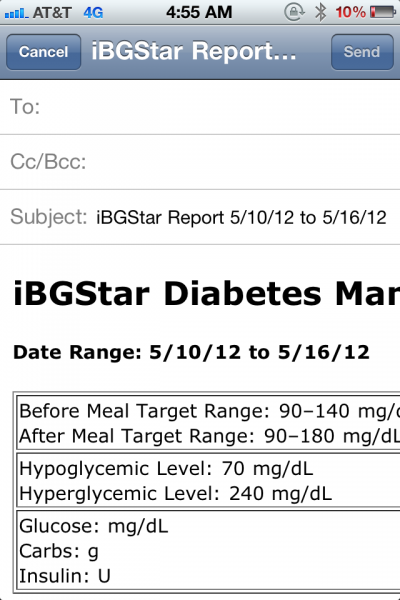 There is evidence to suggest mobile devices used for diabetics improve glycemic control, but a legitimate clinical trial needs to be done with iBGStar before this claim can be made. There is evidence that shows iBGStar is as accurate as other blood glucose meters, but again, no legitimate large clinical trial that shows it improves glycemic control. There is one facet of this peripheral device that can’t be ignored. It has the potential to improve the patient physician relationship, and offers physicians a way to add value to patient visits. For example, patients with Type 1 diabetes are often closely followed by pediatric endocrinologists. Pediatric endocrinologists monitor their diabetic logbooks, and work with parents to make sure glycemic control is properly achieved. Recently I had a patient in the pediatric emergency department who presented with hyperglycemia without DKA. I called their endocrinologist who said they would be more than happy to work with the family to achieve better glycemic control. The endocrinologist asked the patient to send in their glucose logbook to the clinic and based on the logbook, suggestions would be made. Imagine if the family could have sent an immediate email using their mobile device to their physician and have received real time suggestions? Or, imagine if the app and mobile hardware marriage had helped the family maintain better glycemic control, helping avoid the the Emergency Room visit altogether. Thats the hope for iBGStar, and really, for mobile medical technology in general. Disclaimer: The recommendation of prescribing or suggesting this device to patients is up to their physician, and in no way does the author of this post suggest patients should use this device for glycemic control. This post does not constitute a patient provider relationship between the author of this post and the reader. The decision to purchase this device and the method of use is strictly between a patient and their personal health care provider. it is not the IBG Star test strips that cost alot, I mean have you look at other strips… IE: bayer USB meter takes contour strips that run for 50 50-60 dollars or 100 dollars for 100 strips so the price of the strips has no bearing on your subject… The IBG makers offer a program for 50 strips it only costs 20.00 dollars, that’s a great price. at least they offer the program where I have never seen or heard of others even offering any discount program..
I’ve been a diabetic since 2005 I may never know it all, But I do know that every other meter does NOT put anything ( info) in with there meter for a discount.. I am the parent of a t1 diabetic child and we just got one of these from her endo. My 1st impression of the device itself is good. It also works (with a warning that the device is not tested or supported) with my ipad2. My major complaint is with the form factor as well. Not only is the dock not the same as the modern iDevices, but it’s too short to plug through any but a specialized case. I would rather have the miniUSB that the device also has be active (I believe it’s only for charging — at least it didn’t register as a device when I plugged it into my MacBook) so I could use a cable. I really DO like the in app ability to mail the log to the endo — mostly because she expects the format. Our last endo did not like the csv format and I had to manually change my logging to his preferred one day per row style, which threw out a bunch of the data I entered in a one row per entry style. This system uses a one row per entry format. Another drawback for us is the lack of syncing between devices. 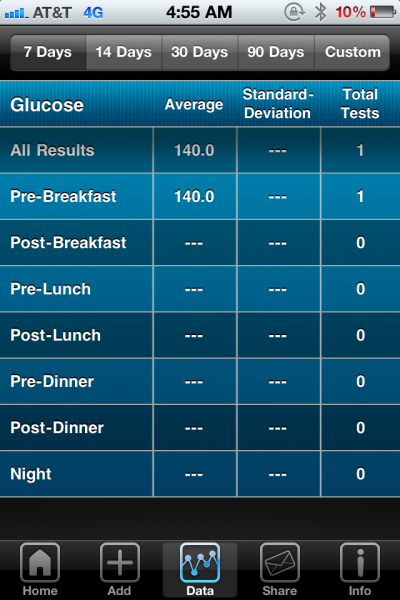 My wife has an iPhone and I have an ipad and while using the device in each will sync bg readings, it won’t sync manually entered carbs/insulin/notes entered in one device with the other. My next job is setting up a mail catcher that will take email logs from both devices and merge them. As a parent of a t1 child, I share your general optimism about this device. I hope they iron out the few annoyances, but even as is this will be a huge help keeping our endo in the loop.